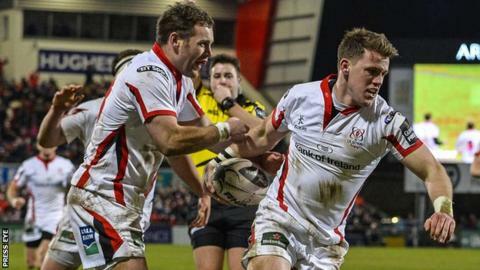 Craig Gilroy and Darren Cave could bolster Ulster's options for Sunday's rearranged European Champions Cup game against Oyonnax in France. Gilroy has been out of action since fracturing an eye socket against Toulouse on 20 December but may be in contention for a return this weekend. Cave has been missing for over a month after sustaining a shoulder injury against Edinburgh. Stuart Olding and Jared Payne are likely to remain out for a few weeks. Centre Olding has not played this season after sustaining a second cruciate ligament injury in three years back in March. Payne has been out since fracturing a foot in Ireland's second World Cup pool match against Romania in late September. Ulster assistant coach Neil Doak said on Tuesday that the Irish province had been hopeful Olding and Payne might be available for the European games against Oyonnax (twice) and Saracens over the next three weekends. "But it has probably fallen on the wrong side for us as far as Stuart and Jared and concerned," Doak told BBC Sport Northern Ireland ahead of Sunday's game in France. The game was originally scheduled to be played in November but was postponed following the Paris attacks, which left 130 people dead. In Ireland World Cup centre Cave's absence, Luke Marshall has formed a highly effective midfield partnership with Stuart McCloskey and those two players may now be in Joe Schmidt's Six Nations thoughts. Doak has been impressed with the recent displays of the two Ulster centres and they again looked dangerous last weekend even though the northern province were narrowly beaten in Belfast by their Irish rivals Munster. "It's a physical, confrontational area and they are fronting up really well for us. "Their displays have been a little bit of a catalyst for us." Such is the attritional nature of the modern game, Doak acknowledges that either Marshall and McCloskey will probably need to be rested in the coming weeks. "You can't keep rolling out guys every week and at some stage we are going to have to look at some rotation. "We may have a few changes this weekend. This is a rearranged European game so it has put a little bit of a spanner in the works." After a disappointing opening European defeat by Saracens, impressive back-to-back wins over Toulouse have put Ulster back in contention for a place in the knockout stages but they may need three closing victories to secure their last-eight berth.